It’s always a privilege to be invited onto Badimia country to help facilitate community driven projects. This time it was particularly special because the second phase of the ‘Arts of the Granites’ project was timed to correspond with Badimia’s NAIDOC week celebrations! 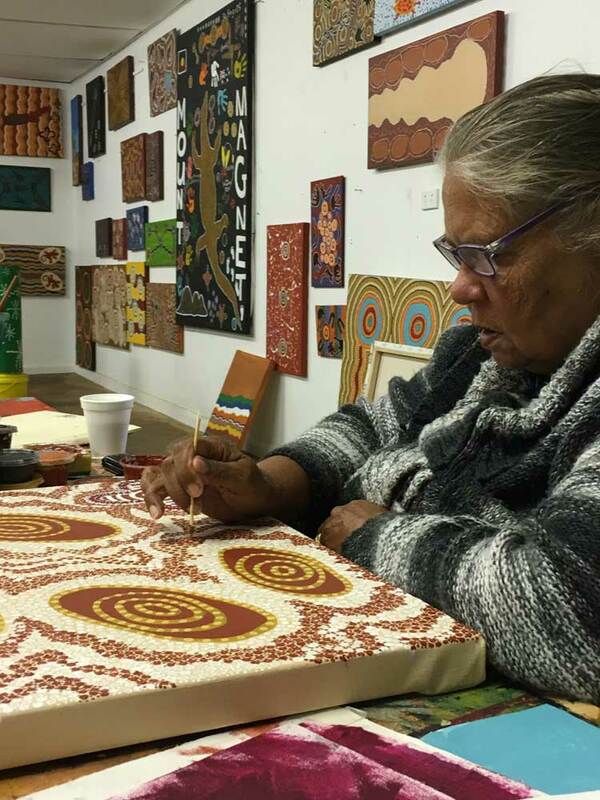 Funded through the Department of Culture and Arts’ Aboriginal Arts – 2015 funding program, the project aims to strengthen Badimia culture within the Mount Magnet community through the medium of artwork in a social, on-country setting. As before, artworks produced as part of the workshops are planned to be used in the future redevelopment of the Granites site in the decoration of signage and other infrastructure, helping to communicate the narrative of the Granites as an important cultural place to visitors. 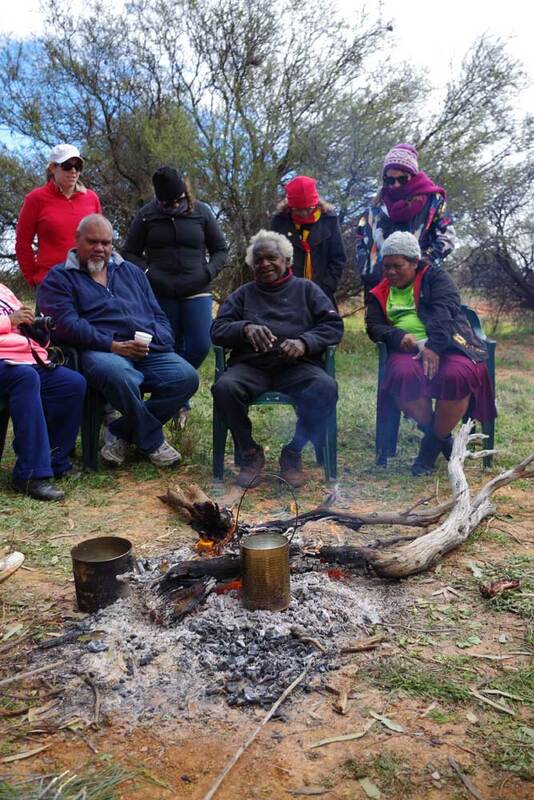 Day one was spent out on Kirkalocka Station where Badimia Elder Ollie George grew up. Upon arrival, the station owners, Ann and Geoff welcomed us with a trailer load of firewood, which was enormously appreciated by everyone due to the Arctic chills and fast turning weather that we were experiencing! The project coinciding with NAIDOC week meant that many Badimia people were able to attend the workshops, which also provided an ideal opportunity to also talk about a strategy for Badimia’s future. The Badimia People’s Native Title was determined in 2015, and after 20 years of waiting for a resolution, was sadly dismissed. As you can imagine, this has been heartbreaking. So, while the workshop facilitators set up and got the billy boiling we got down to the first order of business for the day – a discussion about what Badimia want for their future. The discussion was filled with interesting ideas and a great sense that all the participants knew what they wanted and how they could work together to create better futures for their children and grandchildren. This was particularly significant as included in the group was an 18 day old baby spending his first day out on country with his dad. So stay turned for future updates about a Badimia Healthy Country / Healing Project, now in the works as a result of these conversations!! Trying to warm up on a chilly day! Unfortunately, before there was much of an opportunity to progress too far with the workshops, the rain clouds that had been ominously looming looked ready to burst. We quickly packed up and just got on the road just before the first rain drops started to fall. Despite the setback, it was an amazing day full of fascinating stories about Ollie’s experiences growing up on Kirkalocka, and the history of the Station, and left everyone excited and inspired to really get cracking on with the art workshop. The next morning dawned wet and grey so a decision was made to stay at the Wirnda Barna Art centre rather than setting up at the Granites as planned and risk losing another day. Some fire pits were stoked to warm the centre up and the artists got to work, with respected painters Frank Walsh Snr and Annie Walsh providing mentorship and guidance. Annie spent some time discussing the different traditional symbols that could be used to communicate meaning in artwork; for instance ones for family, campsite, water, digging sticks, and animal tracks. With the school holidays in full swing, there were heaps of kids present, so they were given their own paints and canvases so they could create their own masterpieces! The excitement of the Aboriginal flag being raised in the streets of Mount Magnet for NAIDOC earlier in the week must have provided a lot of inspiration for our junior artists because many of them painted their own! It was great to see their parents and relatives also get involved as many of them helped their kids with their paintings. It was so much fun to get involved in the workshops! Lunch was another community affair with plenty of damper, a barbecue, and a kangaroo tail stew (that vanished in about 5 minutes!). We were lucky enough to have many community organisations also attend the lunch, with some volunteers from Fair Game attending before taking the kids across to the community hall for an afternoon of sports. Once the kids had gone, a few other attendees took the opportunity to paint as the afternoon wound down. As a result of the trip a few more beautiful artworks have been created, and we can’t wait to see what they look like then they’re all finished in a couple of weeks! Though we weren’t able to get back out to the Granites for on-country inspiration, the enormous community support once again shown was inspiring. The huge turnout, ranging from Elders to little kids, enabled the sharing of Badimia culture in many forms – its’ history, food, language, family, and art. We can’t wait to go back!